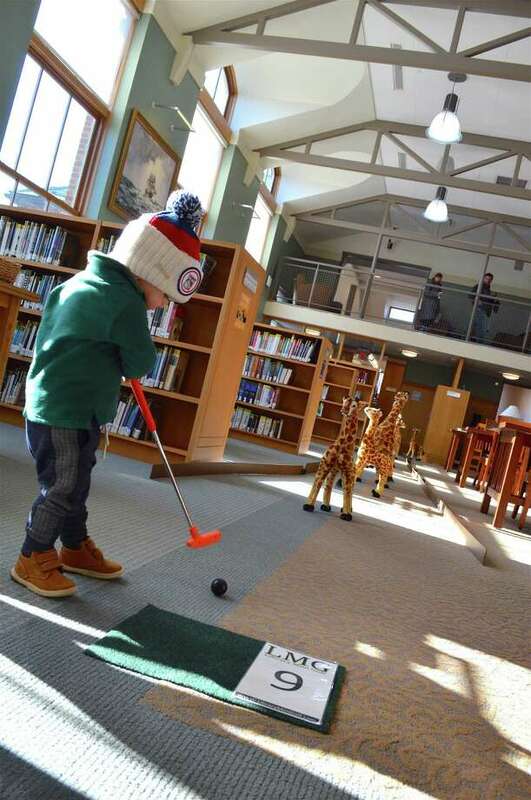 Gus Ceglarski, 21 months, of Darien tees off at the Darien Library's mini golf course, Saturday, Nov. 17, 2018, in Darien, Conn.
DARIEN — One of Darien Library’s favorite fundraisers rolled along with great success last weekend when it hosted its fifth annual mini golf event. “It’s not our biggest fundraiser of the year, but it’s definitely a friend-raiser,” said Caroline Lopez, associate director of operations. There were 21 different sponsors who helped support the 18-hole course, which ran throughout three floors of the building, affording families a chance to putt in and around a maze of books and thematic obstacles. “We’re hoping to get over 1,000 golfers,” Lopez said, with around 700 visiting the course last year.